Within the belief that suicide is generally preventable, the mission of Project Semicolon is to help reduce the incidents of suicide in the world through connected community and greater access to information and resources. We believe that suicide prevention is the collective responsibility of each and every person on the planet. Their website is: https://projectsemicolon.com/ if you’d like more information on them. The Semicolon is meant to make the statement of “Your story is not over”. Our peer ambassadors are planning to wear the semicolon on their wrists using a black sharpie to bring support and awareness to the movement and share the meaning behind it. They will to be set up at a table during the morning period before school and at lunch with information and for any of their fellow HIGH SCHOOL peers that would like to show support with a semicolon. For 7th and 8th graders they will only be providing the information about the Project and its resources. For any High School parents that may wish for your child to not receive a sharpie semicolon on their wrist, which is completely understandable, here is a link to the form for you to fill out so that we can have a list of those students who should not participate in this activity: https://goo.gl/forms/lJBOWHsWvmxFkObM2 7th and 8th graders, again, will not be participating in this particular part of the activity. Please keep in mind that these activities are completely planned and implemented by our Peer Ambassador group and this is an act of awareness that means a lot to them. They want to show their support and get the conversation started so that their peers are not afraid to speak up and ask for help when needed. I am happy to report that their project for this week, to spread positivity and love to their peers by positive thoughts on post-its that could be taken by those who need some extra positive thoughts, has been a success. The Peer Ambassadors are planning to continue this act throughout the school year because of the wonderful response. 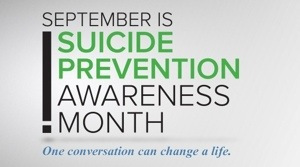 Another note on this month’s activities is that our Peer Ambassador group will be walking in the Out of the Darkness Walk for suicide awareness and prevention on September 9 at Orchards Park in Bentonville, AR. It is from 1-4. If any of you would like to participate with us, please register at: afsp.org/Bentonville If you do wish to walk with us, send me an email and once we figure out where we will be meeting, I can let you know. Thank you for supporting our Peer Ambassadors and their efforts to bring awareness to suicide prevention.